NASA's Phoenix Mars Lander lands on the red planet. The Mars Lander is outfitted with a radiation-hardened RAD6000 computer by BAE Systems built with a 32-bit Power Architecture licensed to BAE Systems by IBM. The space craft heads to the polar north of Mars where it digs into the frozen surface in search of the building blocks of life. As the "brains" of the craft, the RAD6000 processes navigational data and drive key systems both in space and on the planet surface. A similar computer system was successfully used on NASA's Spirit and Opportunity Mars Exploration Rovers mission, launched in 2003. That Rover mission, originally planned for 90 days, amazingly continues to transmit an unprecedented amount of data and stunning photos back to earth. IBM introduces a ground-breaking, comprehensive portfolio of health analytics solutions for health systems. IBM's Enterprise Health Analytics harness the power of massive information generated by today's healthcare industry by converting it into new, data-driven intelligence. This rich source of clinical and business insight can bring strategic differentiation to health systems by giving them unprecedented knowledge about their operations, patients, and other aspects of their businesses. The solutions fill a significant void in data integration and intelligent analyses that currently poses a major barrier to transformation in the Healthcare Industry. IBM releases WebSphere Premises Server version 6.1, a software product that enables business process transformation by responding to the insights provided by sensor data. Using a solution based on WebSphere Premises Server, a company can draw useful business information from an infrastructure of networked sensors, such as location, temperature, vibration, humidity, or other important status or environmental factor information. For example, a fork lift carrying a pallet of strawberries can be tracked as it travels through a distribution facility. Software will alert the driver and operations manager if the strawberries are left in an area that condition sensors show to be above a certain temperature. In this way the business can reduce spoilage and help ensure that consumers can buy the freshest possible fruit. IBM WebSphere Application Server, a key building block for services oriented architecture (SOA), shattered a popular industry benchmark for scalability and performance by more than 33 percent using technology that costs half the price of the competition. Businesses rely on application servers to build, run, integrate and manage hundreds or even thousands of software applications. This makes high performance and scalability of these application servers critical to the success of a company's SOA strategy. IBM delivered more than 50 million business transactions per hour, beating the previous mark, set in 2004. IBM introduces a new supercomputer powered by one of the world's fastest microprocessors and cooled by an innovative water system. The new Power 575 ® supercomputer, equipped with IBM's latest POWER6 ® microprocessor, uses water-chilled copper plates located above each microprocessor to remove heat from the electronics. Requiring 80 percent fewer air conditioning units, the water-cooled Power 575 can reduce typical energy consumption used to cool the data center by 40 percent. * IBM scientists estimate that water can be up to 4,000-times more effective in cooling computer systems than air. With 448 processor cores per rack, the new Power 575 offers more than five times the performance of its predecessor, and thanks to advanced water cooling and POWER6 efficiencies, is three times more energy efficient per rack. Scientists at IBM's Zurich Research Lab are working on the future of water cooling, bringing cold water to the hottest part, directly on the chip itself, and then capturing the water at its hottest and piping it off the chip for re-use to heat homes or the town swimming pool, for taking showers, or for use in cooking. IBM's history-making hybrid supercomputer, built for the National Nuclear Security Administration's (NNSA) Los Alamos National Lab, burned its way into the TOP500 Supercomputer record book as the most powerful system in the world. Its sustained performance of 1.02 petaflops (1.02 quadrillion calculations per second) is more than three times faster than the nearest non-IBM system. The petaflop-smashing system uses 12,240 IBM PowerXCell 8i Cell Broadband EngineTMprocessors -derived from chips that power today's most popular videogame consoles. It also has 6,562 AMD Opteron Dual-Core processors performing basic compute functions, which free the IBM PowerXCell 8i chips for the math-intensive calculations that are their specialty. This "hybrid" architecture, which optimizes the strength of multiple types of processors, is an IBM hallmark. Lead engineer Don Grice of IBM inspects the world's fastest computer in the company's Poughkeepsie, NY plant. The computer, nicknamed "Roadrunner", was built for the Department of Energy's National Nuclear Security Administration and will be housed at Los Alamos National Laboratory in New Mexico. IBM engineers in Poughkeepsie, N.Y., Rochester, Minn., Austin, Texas and Yorktown Heights, N.Y., worked on the computer, the first to break a milestone known as a "petaflop" -- the ability to calculate 1,000-trillion operations every second. The computer packs the power of 100,000 laptops -- a stack 1.5 miles high. Roadrunner will primarily be used to ensure national security, but will also help scientists perform research into energy, astronomy, genetics and climate change. In order to help customers gain greater efficiency from their IT resources, IBM opens in Guadalajara, Mexico, the world's first center specifically designed to help clients across the globe develop and implement long-term plans to manage and archive massive amounts of business information. The archiving and retention of information -- including documents, email, video, audio, medical files, etc. -- is expected to increase at a nearly 60 percent compound annual growth rate by 2012 which is an 800 percent total increase in archive capacity over a five year period of time. To address this demand, IBM opened its Global Archive Solutions Center. Under one roof, IBM's team of archive subject matter consultants can simulate real-world customer environments and present solutions in real time using IBM software and storage technologies. IBM introduces the semiconductor industry's first 45-nanometer (nm) Silicon on Insulator (SOI) foundry offering. The new offering adds industry-standard design tools and libraries to the intellectual property already available through IBM's existing SOI development infrastructure, and allows a wide range of client designs to take advantage of SOI's benefits. IBM was the first company to begin commercially shipping SOI technology in its server products during the 1990s. A key to SOI's expansion beyond high-end applications is the generation-to-generation decline in the cost differential between SOI and bulk CMOS technologies, as demonstrated by IBM's success with SOI in the cost competitive gaming console processor market, where IBM's SOI technology is currently used by all the major gaming providers continuing to help transform the gaming industry. IBM testing has shown the potential for 45nm SOI to offer up to 30 percent performance improvement or 40 percent power reduction when compared to the industry-standard bulk complementary metal-oxide (CMOS) technology. This price/performance leadership combined with ever- increasing application workload demands will create opportunities for SOI to expand into an even a broader range of consumer electronics, such as digital televisions and high-end mobile applications. An even closer look at the miniature "tuning fork" inside the AFM used in this IBM Research work. The tuning fork measures the interaction between the tip of the microscope and the atoms on a surface; when the tip is positioned close to an atom on the surface, the frequency of the tuning fork changes slightly. The frequency change can be analyzed to determine the force exerted on the atom. IBM makes two scientific breakthroughs in the study of graphene in building nanoelectonic circuits vastly smaller than those found in today's silicon-based computer chips. Graphene has attracted immense worldwide interest because its unusual electronic properties may eventually lead to vastly faster transistors than any achieved so far. A key advantage of graphene lies in the very high electron speed with which electrons propagate in it, essential for achieving high-speed, high-performance transistors. For the first time anywhere, IBM scientists have found a way to suppress unwanted interference of electrical signals created when shrinking graphene, a two-dimensional, single-atomic layer thick form of graphite, to dimensions just a few atoms long. These graphene ribbons could prove useful for building future semiconductor devices for use in sensors, communications devices, computing systems and more. 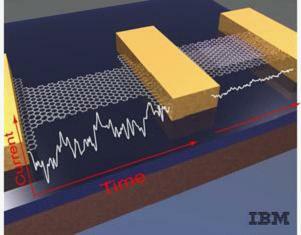 IBM researchers also demonstrate the operation of graphene field-effect transistors at GHz frequencies, and achieved the highest frequencies reported so far using this novel non-silicon electronic material. Now, also for the first time, IBM scientists have established the scaling behavior, i.e. the size dependence of the performance, of the graphene transistors. The image on the left shows a single layer, or sheet of carbon molecules known as Graphene. The noise that occurs from electrical signals bouncing around in the material as a current is passed through it is greater as the device is made smaller and smaller, impeding the performance for nanoscale electronics. In the image on the right, the IBM scientists demonstrated for the first time that adding a second sheet of Graphene reduces the noise significantly, giving promise to this material for potential use in future nanoelectronics. IBM scientists take another significant advance towards sending information inside a computer chip by using light pulses instead of electrons by building the world's tiniest nanophotonic switch with a footprint about 100X smaller than the cross section of a human hair. The switch is an important building block to control the flow of information inside future chips and can significantly speed up the chip performance while using much less energy.his advance is a continuation of a series of IBM developments towards an on-chip optical network: in 2005, IBM scientists demonstrated a silicon nanophotonic device that can significantly slow down and actively control the speed of light; in 2006 an analogous tiny silicon device was used to demonstrate buffering of over a byte of information encoded in optical pulses a requirement for building optical buffers for on-chip optical networks; and in 2007, IBM scientists announced the development of an ultra-compact silicon electro-optic modulator, which performs the job of converting electrical signals into the light pulses, a prerequisite for enabling on-chip optical communications. One hundred IBM employees from thirty-three countries participate in the company's new Corporate Service Corps program, part of the Global Citizen's Portfolio initiative, to develop leadership skills while addressing socio-economic challenges in emerging markets. Twelve teams of employees are sent to Romania, Turkey, Vietnam, the Philippines, Ghana, and Tanzania in 2008 to work on projects that intersect economic development and information technology. The assignments were selected to use the skills IBM employees possess. More than 5,000 high-potential employees applied to the program, but only 100 employees were selected, making this one of the most competitive employee programs ever created by the company. IBM selects another 100 before the end of the year, and commits to enabling 600 of its emerging leaders to participate over the next three years. IBM and researchers at the University of Washington launch a new program to develop stronger strains of rice that could produce crops with larger and more nutritious yields, which could have a far-reaching impact on global health. With the processing power of 167 teraflops, equivalent to the world's Top 3 supercomputer, IBM's World Community Grid will harness the unused and donated power from nearly one million individual PCs in a new initiative -- "Nutritious Rice for the World" project -- that will study rice at the atomic level and then combine it with traditional cross breeding techniques used by farmers throughout history. Ultimately, this project, jumpstarted by a National Science Foundation grant, could enable rice-producing countries to become better adapted to future climate changes by creating rice breeds that are more resistant to changing weather patterns. In addition, the knowledge gained from studying rice can be easily transferred to other cereal crops such as corn, wheat, and barley. By the end of 2008, the project is three months ahead of schedule, with more than 400,000 volunteers donating the equivalent of 9000 years of computer time. World Community Grid also hits its own milestone, reaching one million registered computers helping to advance several research projects on diseases like cancer and AIDS.